Springfield 911 Vintage Blue Polished Stainless Steel 380 ACP Pistol With Ameriglo Pro Glo Tritium Night Sights, Engineered Ivory Grips, 2 Magazines, Holster & Soft Case PG9109VBS. The trigger is exceptional on this lightweight, concealed carry pistol. 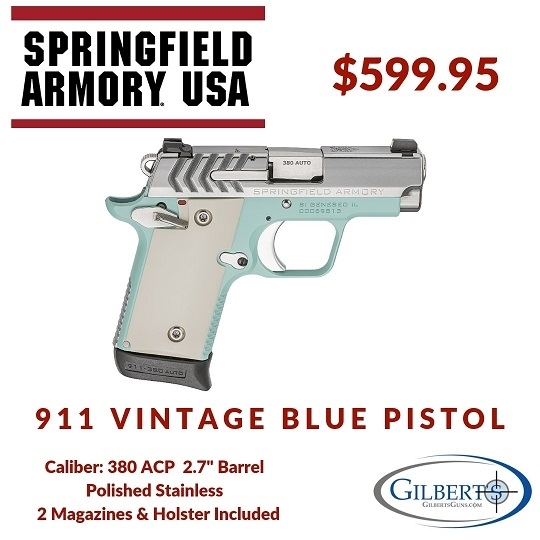 Stop in and check it out and let us know what you think about the new Springfield Armory 911 pistol in vintage blue!